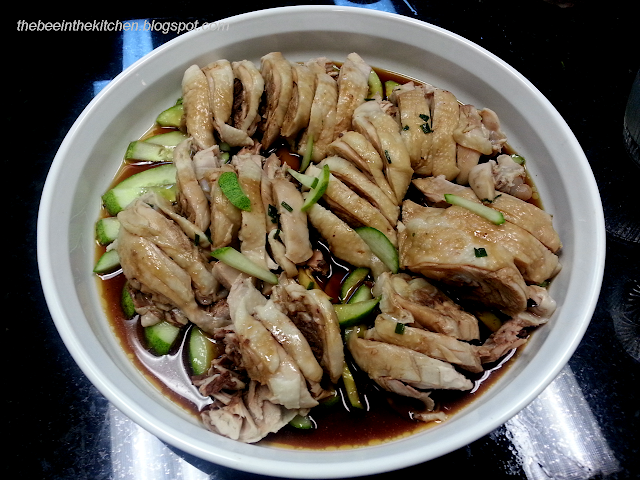 A few months back, there has been a surge of hainanese chicken places all over the metro. They range from the very authentic and slightly expensive- Tao Yuan tops our list- to the "fakes". This dish which has travelled all the way fom Singapore proves to be a mainstay as it has become a rather healthier alternative to the classic favorite fried chicken. We, are, afterall a Chicken Country. I was really surprised to learn that it was so so easy to make something so good and healthy. And you need very few ingredients too! Thinking slow-cooked? Think again- it's literally fast-cook =D! Here's the version I made at home. - In a large pot, boil 6-8 cups of water with the slices of ginger. - When done, remove from heat and immediately transfer to prepared ice bath. This prevents the chicken from being overcooked. - Cook jasmine rice in the soup from the chicken, include the fat, but REMOVE the scum.